Before European ships landed on North American soil, bighorn sheep thrived in this country. Massive rams battled in alpine meadows, lambs frolicked along rocky ridges, and herds crisscrossed stark desert landscapes. At one time, more than two million bighorn may have inhabited the American West. But as settlers moved westward, these wild sheep began to disappear from the landscape. Along with the settlers came domestic sheep and goats carrying new diseases that decimated bighorn herds. Overhunting wreaked further havoc on the dwindling populations, and by the middle of the 20th century, less than 20,000 bighorn remained. Since then, wildlife agencies and hunting interest groups have undertaken dedicated conservation efforts to bring the species back from the brink. Over the last fifty years, millions of dollars and countless hours have been spent improving bighorn habitat, relocating sheep, and trying to ensure the survival of at-risk herds. 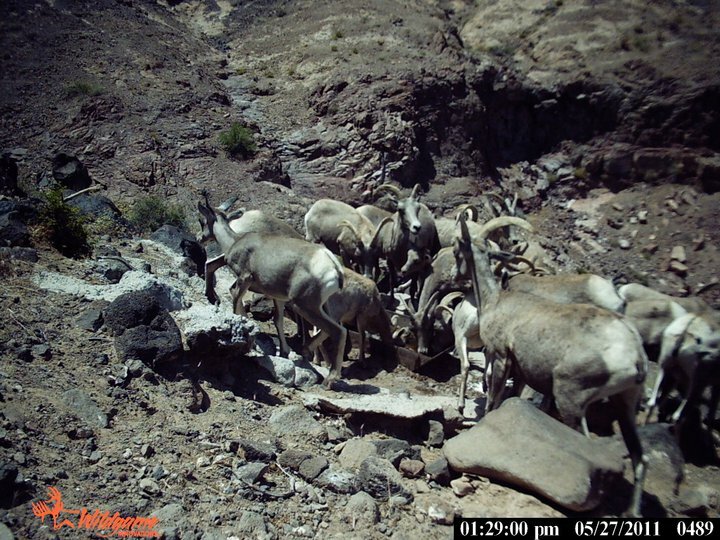 Nevada may be the most successful state in terms of restoring bighorn populations, carefully nursing a struggling population of less than 3,000 in 1968 to more than 11,000 today. Other states have also made huge progress, and the number of bighorn across North America has more than tripled since intense conservation began in the 1960s. But despite this success, the species continues to face an uphill battle. Drought has always played a role in the ecology of the western states, and bighorn sheep are uniquely adapted to thriving in tough terrain. However, drought conditions are expected to persist or intensify across most of the West in the coming years, causing challenges for wild sheep. Although bighorn can usually withstand long periods with little to drink, catastrophic die-offs can occur when water sources go completely dry. 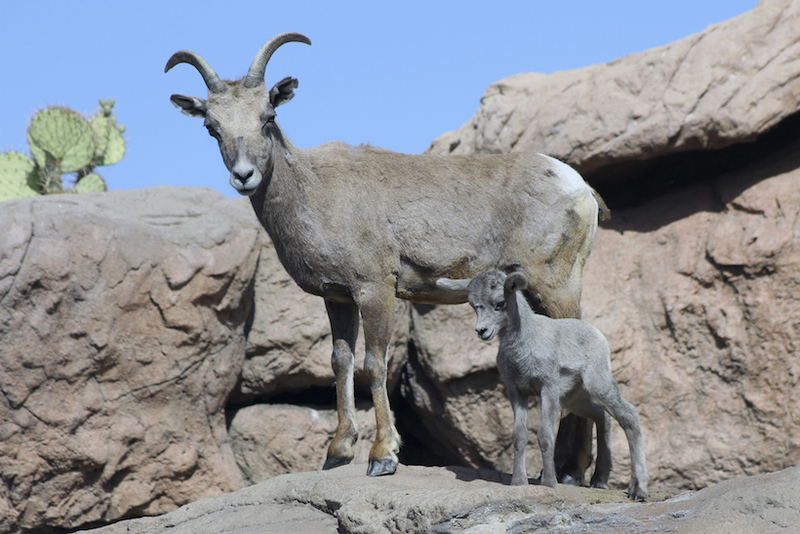 Water catchments have been installed in some of the driest bighorn habitat – often by hunting interest groups like the Wild Sheep Foundation and the Fraternity of the Desert Bighorn – which can help the sheep weather particularly dry seasons. The most damaging effect of drought for bighorn is its long-term effect on reproduction. “It all boils down to forage and water,” said Clinton Epps, an assistant professor at Oregon State University. “When it gets too dry, the bottom line is are they getting enough forage in the spring for the ewes to be able to raise the lambs?” If not, the lambs won’t survive. In the past, herds experiencing drought could simply move along, seeking out higher-elevation areas with more precipitation and longer growing seasons. This ability to move freely throughout the landscape, which scientists refer to as “connectivity,” is vital to bighorn survival. Not only does it help wild sheep find food in tough times, it also allows them to mingle with neighboring herds to maintain genetic diversity. As roadways and developments sprout up across the previously-wild West, connectivity is becoming harder and harder to protect. 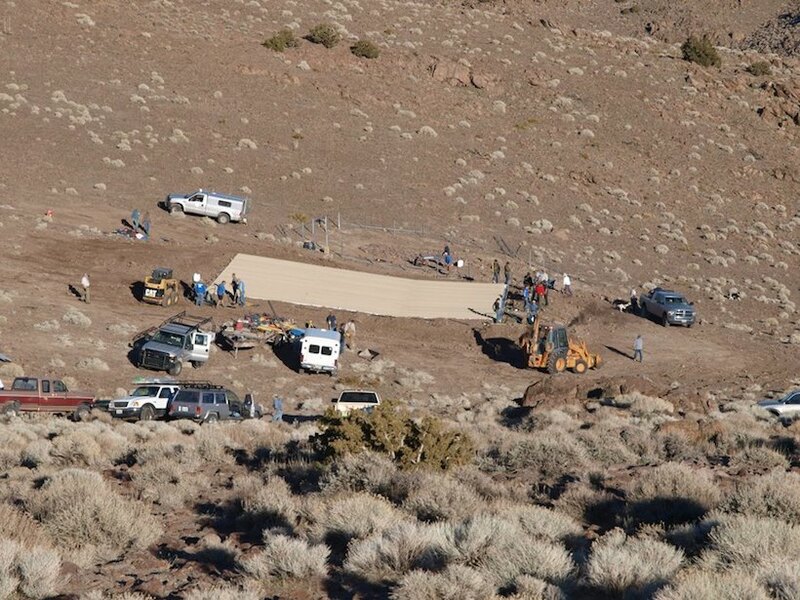 That means that bighorn may not be able to deal as well with dry conditions. “This has been a natural process, droughts come and go,” explained Epps. “[But] once we start tinkering with their ability to recolonize areas,” he continued, “we’ve affected the resilience of that system and we can’t just shrug and say ‘well, they’ve dealt with droughts in the past, surely it’ll all work out.’"
So maintaining connectivity – by constructing highway overpasses, protecting land, and creating other wildlife corridors – may be the key to helping bighorns cope in a warmer, drier world. Connectivity can be a double-edged sword, since it also puts wild sheep at risk for the very same diseases that decimated them in the first place. Thanks to states’ success in bringing bighorn back, larger herds are inhabiting a wider swath of the West. And with more wild sheep in more places, there’s a growing chance that bighorn will mingle not only with each other, but also with domestic sheep and goats that can pass along pathogens in the process. The disease that poses the biggest danger to bighorn is what scientists call “bighorn pneumonia complex.” It is caused by bacteria that can trigger a suite of symptoms, from coughing and sneezing to head-shaking and lethargy. Herds infected with pneumonia often suffer more than 50% mortality; outbreaks killed 90% of bighorn herds in Montana’s Elkhorn Mountains in 2008 and in East Humboldt, Nevada in 2009 and 2010. These lethal effects can last more than a decade, sometimes whittling herds down to less than ten individuals. Once a herd is infected with pneumonia, wildlife agencies have few options. Vaccination and antibiotics are usually impractical, due to the difficulty and expense involved in treating wild sheep. In some cases, managers take a slash-and-burn approach, culling infected sheep to prevent them from passing the devastating disease to healthy herds living nearby. Once in a while, a herd will recover fairly quickly from a pneumonia outbreak. Researchers and wildlife agencies are carefully studying these populations to figure out why they have bounced back, while other herds have not. “Is there something we can learn from them that can help us manage the others?” asked Wolff, suggesting that genetics, habitat, or a specific strain of bacteria may play a role in these recoveries. “It requires ongoing research and collaboration amongst the states to try to figure out what we can do,” she explained. Prevention remains the best way to limit the spread of disease. Maintaining separation between wild herds and domestic sheep and goats is most states’ top priority when it comes to bighorn, keeping pneumonia-causing bacteria from infecting wild sheep in the first place. 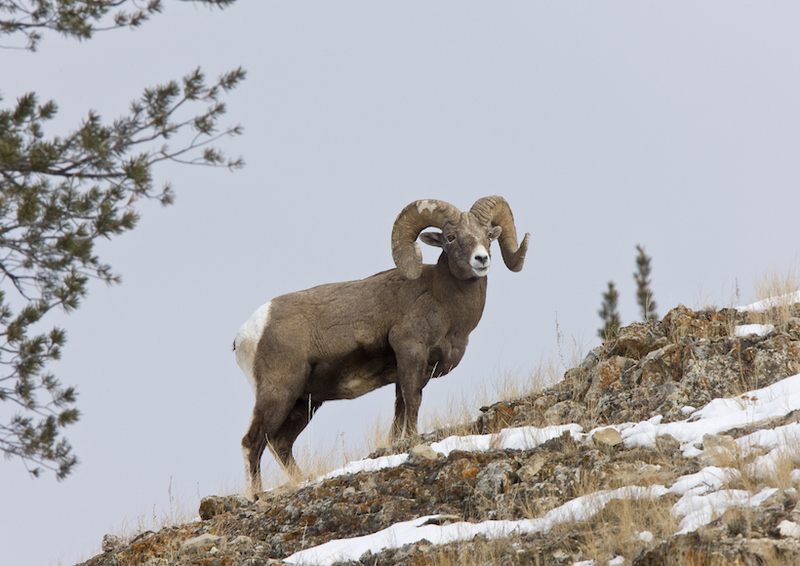 Keeping bighorn populations under control also goes a long way in keeping them healthy. Herds can suffer when they get too large, competing for limited amounts of food and water and passing around both parasites and pathogens. This overcrowding can force sheep to start wandering farther afield, increasing the likelihood of another outbreak. Where herd size has reached – or exceeded – what the habitat can support, hunters can play a vital role in conservation by removing just enough animals to keep populations manageable. Thanks to growing populations, bighorn harvest opportunities are on the rise in some states, including Utah and Nevada. 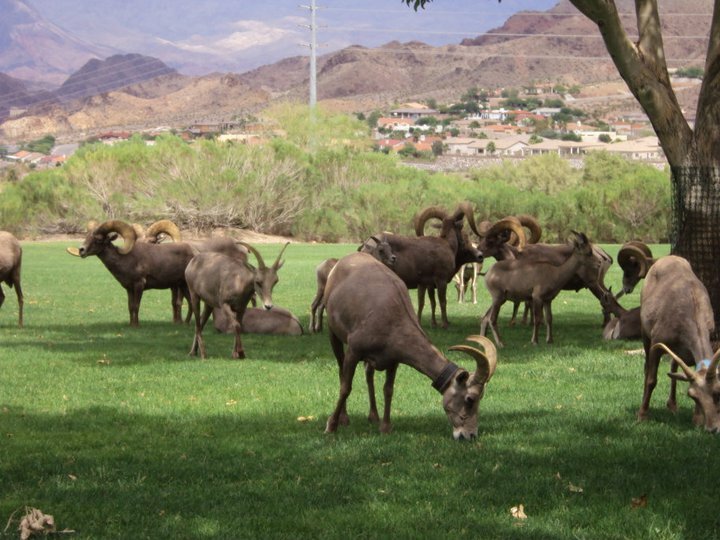 In fact, Nevada’s conservation program has been so effective that its bighorn population is now far too large, prompting the state to hold its first bighorn ewe hunt this year. “The Muddy Mountains is kind of an island of reproduction at the moment,” said Doug Nielsen, education supervisor for the Nevada Department of Wildlife. “Even with all the trapping that we’ve done,” he explained, “there are about 200 animals above its sustainable management level.” To bring populations back down to a healthier size, 85 ewes will be hunted this year in three areas around the state. Hunters have a subtler conservation role to play as well. “Sportsmen and women are our eyes and ears on the landscape,” Wolff explained. “I can’t tell you how many times we have gotten information back about something that’s going on because they have been out scouting.” Wildlife agencies use tips about the whereabouts of coughing bighorn and stray domestic sheep to help them decide where to concentrate their efforts. Hunters have also footed much of the bill for the conservation of both game and non-game species across North America through excise taxes, license fees, and donations. Despite the many contributions that hunting has made to bighorn sheep recovery, it’s not a silver bullet. Conservation programs must balance hunting with other management practices in order to be successful. Because of pneumonia’s lasting consequences on reproduction, the areas hit hardest by disease often require many years to recover. 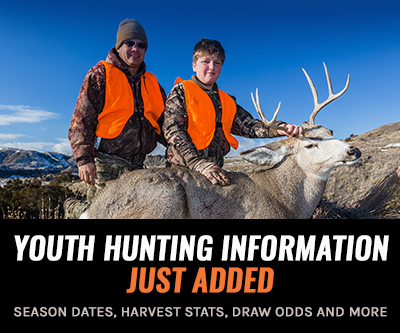 So following outbreaks, states often decrease, or even eliminate, hunting opportunities for several seasons. Along Idaho’s Salmon River, for example, bighorn hunting was halted for ten years in the late 1990’s to allow the population to rebound. 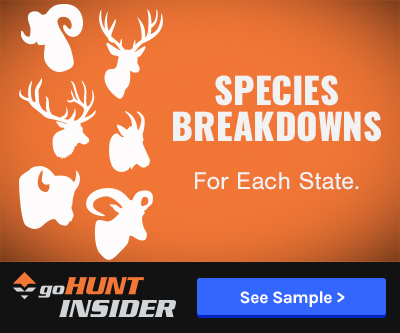 “Certainly, disease is limiting the hunting opportunity hugely,” said Frances Cassirer, a wildlife biologist with the Idaho Department of Fish and Game. She noted that bighorn quotas in Idaho “are stable now. But if you look at the past 25 years, they’ve decreased.” Tag numbers also fell in California this year after significant bighorn die-offs. Beyond enforcing harvest quotas, state wildlife agencies must also make other tough calls related to hunting. From certain equipment bans to the long-odds lottery system, restoring bighorn means making difficult – and at times unpopular – decisions. Even Nevada’s ewe hunt, which increases the number of hunting opportunities in the state, has garnered some criticism. In order to be successful, bighorn conservation will require a delicate balance of careful management methods. It will mean compromising between a human-centered landscape and one where nature is a priority. It will take constant collaboration between land managers, scientists, hunters, wildlife watchers, and anyone else with a stake in protecting wildlife in the West.